I'm a bit embarrassed, it's been 28 days since my last post. Of course! I have an explanation. For about 28 days I have had no interest at all in painting, building or gaming. Why the lack of interests I do not know. Late this Saturday night I talked with Kristian about a potential colour scheme for his Necrons, I felt the 40k spirit touch me ( it was definitely the spirit, not Kristian). I felt pure happiness! I believe the Emperor was calling me. 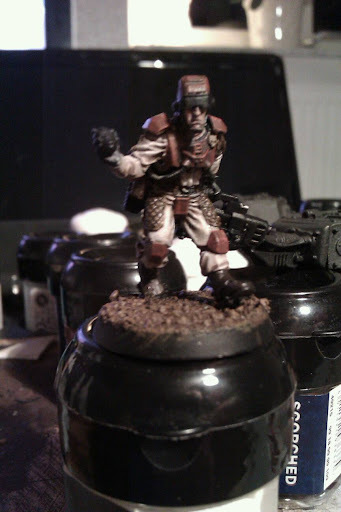 Sunday evening just after finishing work I started paint on one of my Elysian. 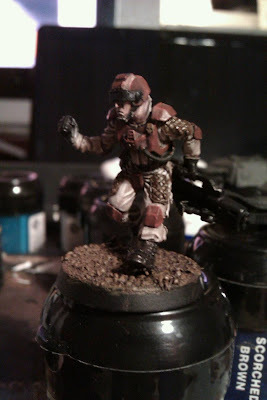 I searched the Webb for a good skin painting technique and found approximately to many. After about an hour of searching I finaly decide to copy Games Workshops beastmen version. It was a bit complicated since it involved much mixing of colours but I liked it. The good thing with painting skin is, its no problem if the minis does not look exactly the same. All skin types are different. Nice. i like the colors. a killteam? Nice colours! What will the visor be in? My tip is ice blue or the same you use for the windows on the valkyrie. Blue is on my mind but I don't know how. start of with 200 then. Great! The colours work realy well together. You have to tell me how you painted the pants! They are awsome. My vote is on blue visor's as well. But if you feel crazy, go for red! I'm crazy, but not red crazy my young hip-hop friend. Blue is ky colour. You will all soon know the colour scheme. As soon as the first mini is ready I'll tell you.